As a small and sturdy element within the home, residential chimneys often go unnoticed or neglected until something goes awry. In many cases, an old, decaying smokestack can be considered a serious fire concern, and for some homes, structural dangers as well. 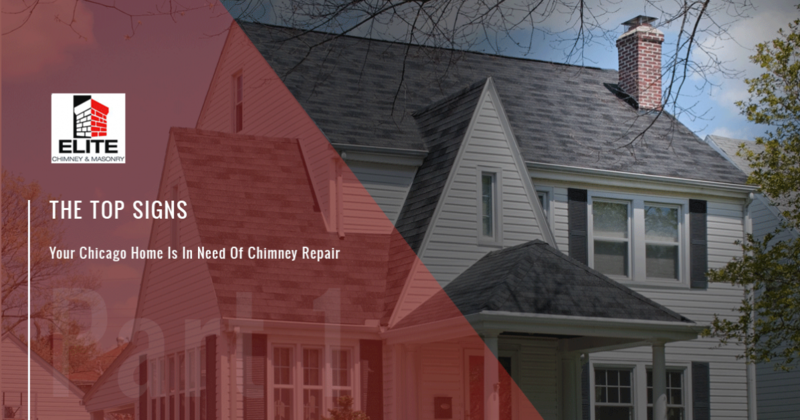 If you are a proud Illinois homeowner but are unsure when it is time to call for chimney repairs in Chicago, the team here at Elite Chimney & Masonry is here to help. Since 1998, our chimney cleaning and repair company has worked to be your top choice for service, assisting customers as comprehensively as possible through education and affordable chimney services to create beneficial relationships that last a lifetime. Regardless of the size or scope needed, our chimney repair specialists are here and ready to get to work. In many cases, we are called out to a site once a homeowner has determined they need chimney waterproofing, improvements, or repairs. If you are unsure when is the right time to call, read below to see if any of the signs mentioned match your Chicago home’s chimney. Elite Chimney & Masonry is here to deliver affordable, long-lasting results, so be sure to call us for service today! As an entry point into the home, your chimney may harbor moisture. Homeowners with properly working fireplaces will likely never notice rust. If you spot rust forming on metal components, including your fire box or damper, now would be a good time to call for a chimney inspection. Remember that this entry point functions best when sealed by the damper and chimneys waterproofing elements. Fireplaces that suffer from rust are likely not keeping the elements out or are not operating properly. In some cases, water can infiltrate your flue through open damages from exterior impacts, environmental changes, or settling foundations. Cracked flue tiles can be very dangerous, as they elements work to keep the heat and flame of your fireplace safely contained, Homeowners that neglect to inspect their chimneys run the risk of their house catching on fire through an opening. Upon inspecting your chimney, you may notice that the mortar holding your masonry together is beginning to chip and fall apart. Before tabling this for your future self, Elite Chimney & Masonry highly recommends seeking out professional chimney repairs. Mortar that has been damaged or chipped creates more opportunities for moisture to infiltrate. Chicago chimneys feel the full force of our freeze/thaw cycle, with this moisture freezing and expanding when the weather turns chilly. If left unremedied, this moisture can begin to cause bigger and bigger cracks. Operating your fireplace during the winter can quickly heat the now-brittle mortar, resulting in more rapid deterioration. Homeowners that neglect to fix these issues risk a structural failure in the future! If you are concerned about the condition of the mortar holding your stack together, our experienced team can assist with honest and affordable results. One common occurrence that often creates the need for chimney repairs in Chicagoland and beyond is efflorescence, or the white stains that develop upon the masonry that comprises your chimney. Salts found in water and other solvents used across numerous industries creates a natural salt content within the material. Over time, this salt interacts with moisture and begins to travel to the surface, creating unsightly white stains in the process. Chimney maintenance services can help to improve the aesthetics of your smokestack. Chimney inspections are recommended for homeowners who notice this process occurring on their homes. Efflorescence is indicative of excess moisture infiltrating your bricks, stones, and/or concrete blocks. Without proper chimney waterproofing measures, you can face the risk of material breakdown and premature deterioration. Our blog post is not meant to scare you into calling us for service, we are simply passionate about providing the best services and chimney repairs to Chicago homes. Next time, we’ll continue this post by discussing a few more warning signs that you need assistance. Our team is here to provide reliable, honest guidance in creating the safest and most cost-effective for your Illinois property. Elite Chimney & Masonry is here and ready to help clients of all sizes and budgets. Contact us today to schedule your chimney inspection!